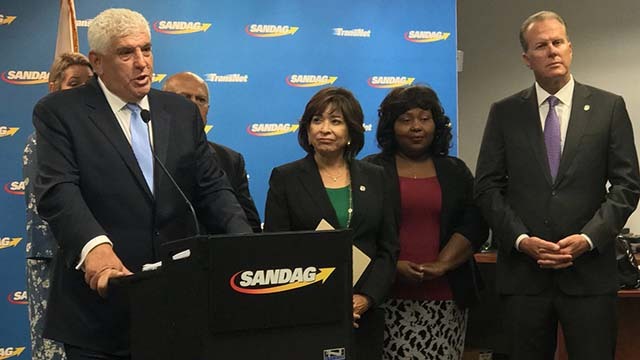 The San Diego Association of Governments announced Friday the selection of well-known Los Angeles planner Hasan Ikhrata as its new executive director following a nationwide search. Ikhrata has led the Southern California Association of Governments, which represents 191 jurisdictions with 19 million people, since 2008, and has previous experience with the Los Angeles County Metropolitan Transportation Authority and South Coast Air Quality Management District. He will take over the regional planning in California’s second most populous county, leading an agency responsible for raising the funds and directing construction of key road and transit infrastructure. 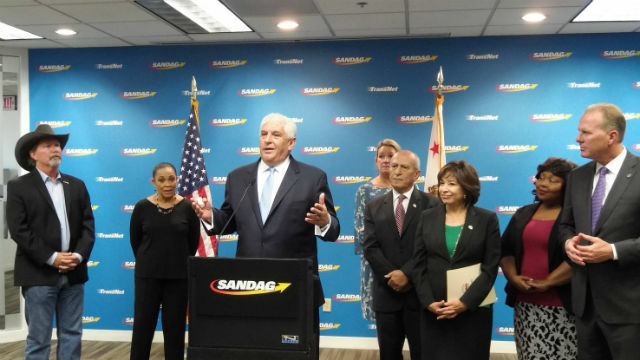 SANDAG has 370 employees and administers an annual budget of $1.3 billion. “He’s run a big organization like ours — even bigger than ours — and he’s run it very well. Most importantly, he’s a proven consensus builder,” said SANDAG Chair Terry Sinnott, a Del Mar city councilmember. Ikhrata would be paid $414,149 annually — the same as his current Los Angeles compensation — and could potentially earn a 7 percent bonus. He will be an at-will employee, but would receive six months severance if dismissed without cause. He will start work in San Diego on Dec. 3. The size of the compensation package resulted in push back from Jim Desmond, the mayor of San Marcos, who asked that the employment offer be made contingent on developing performance goals. In the end, the board voted to create performance goals, but not make the employment offer contingent upon them. Desmond voted against hiring Ikhrata, as did El Cajon’s representative. “I understand the compensation package in the public sector is high, but if you want the best, you have to pay comparable packages,” said Escondido Mayor Sam Abed, who was on the subcommittee that selected Ikhrata. Ikhrata’s predecessor, Garry Gallegos, resigned a year ago amid a scandal over inaccurate revenue projections for a sales tax ballot measure. In a reference to that issue, Ikhrata said that in Los Angeles he learned that it is best to develop a clear vision for new projects before seeking funding. He said he planned to focus on “policy, not politics” and build consensus. 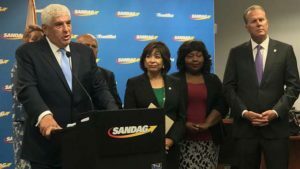 San Diego Mayor Kevin Faulconer said Ikhrata “brings incredible expertise and a new perspective that SANDAG greatly needs.” Faulconer, a SANDAG board member, also sits on subcommittee that led the recruitment effort. According to SANDAG, Ikhrata earned a master’s in civil and industrial engineering from University of California, Los Angeles, and is a doctoral candidate in urban planning and transportation at the University of Southern California. Ikhrata also holds a bachelor’s and a master’s degree in civil and industrial engineering from Zaporozhye University in the Ukraine. The executive director reports directly to the board of directors composed of 21 elected officials from the region’s 18 cities and San Diego County government.